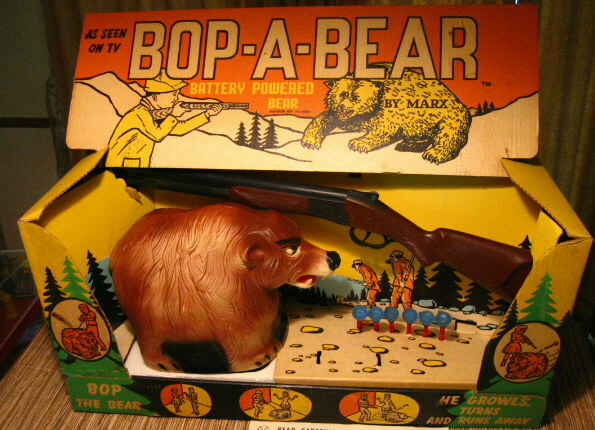 When I was growing up in the 60’s there was a TV ad for a game called Bop a Bear. A little girl asks her brother what he is doing. “Hunting bears!” he says. “In the house?” she retorts. “Sure, bears are everywhere, there goes one now.” Bang! I am not sure why I remember that ad so vividly, but I do. Someone once said that elderly people do not really suffer from Alzheimers they just have no more memory space left in their brains because they are jammed full of TV ad jingles. Other than at the zoo, I have never seen a real live bear up close… until last week. We were spending some vacation time at the family cottage on Lake of the Woods in Ontario. 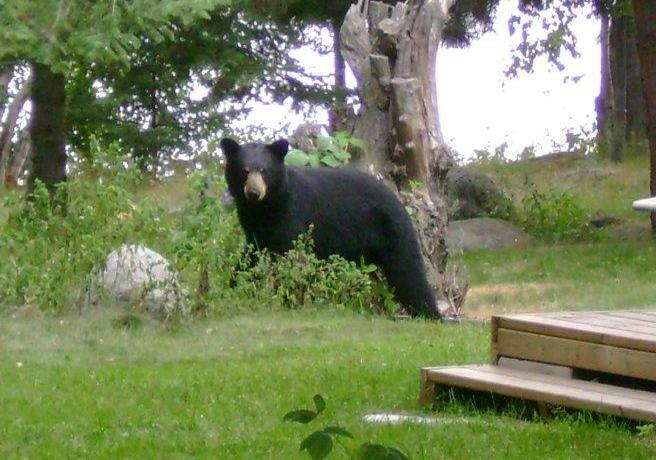 Kathy was washing the dishes and she shouts, “Mark there’s a baby bear in the backyard, go take a picture.” Being the dutiful husband I am I grabbed her camera headed out after the bear which had now wandered down the path. When I had caught up to the bear he turned around and looked at me. As I snapped off pictures I now realized it was not a baby at all but a full grown male. And he was starring me down. Everything I have read about bear safety suggests that you don’t chase after bears. Fortunately, he bolted into the bushes instead of after me. Upon returning to the cottage I discovered that he had already been inside. He torn open the screen door and had gone for a tour of the kitchen. This was not really bizarre behaviour as the dry weather this year has produced almost no berries and other food for the bears and they are going into populated areas looking for food. He had also gone through Kathy’s garden and eaten all the lettuce, which was just about ready to be picked. She was not a happy camper… literally. Bears and people do not dwell well together. I got my shotgun and gave chase to the bear. I had no intention of killing it as I did not want a 400 pound bear carcass to have to deal with. I just wanted to scare him off. I caught up to the bear and took a couple of shots over the bow so to speak. That was the last we saw of him. Here is the actual shot of him at our back door. When King David went up against Goliath he claimed that he had killed both a lion and a bear and he was going to do the same to the giant. My incident with the bear made think about how the scripture describes Satan as a wild beast. Be sober, be vigilant; because your adversary the devil walks about like a roaring lion, seeking whom he may devour. 1Peter 5:8 The Devil will eventually arrive at your door step. You have to decide what you are going to do about it. The scripture says the Devil is SEEKING whom he MAY devour. It is not a given that you will be devoured. It is those who are unaware and unprepared that are victims of bear attacks. The same is true with our spiritual adversary. He seeks those whom he MAY devour. 2) Don’t leave your back door open. We sometimes have many other things we do in our lives that are an open door to the Devil. Unforgiveness, bitterness, anger, jealousy, are all subtle internal feelings that invite Satan right into our lives. People who entertain these things should not be surprised when the Devil comes a calling. Things like the horoscope, New Age thought, Eastern mysticism, even Halloween are not a back door but a front door invitation. 3) Don’t go chasing after him. Chasing after the bear that day was not my most brilliant move. One on one he would have torn me limb from limb. The same is true for the Devil. We don’t want to be demon chasers, seeing one behind every bush and under every rock. 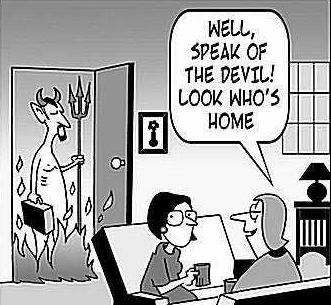 Christians who become preoccupied with the Devil tend to give him invitation as well. “Yet Michael the archangel, in contending with the devil, when he disputed about the body of Moses, dared not bring against him a reviling accusation, but said, “The Lord rebuke you!” Jude 1:9 If Michael the angel who ran Satan out of heaven doesn’t pick fights with Satan, then neither should we. 4) Use your spiritual weapons to chase him off when he does shows up. God has not left us defenseless. For the weapons of our warfare are not carnal but mighty in God for pulling down strongholds. 2 Cor 10:4 All I did was take a couple of shots at the bear and he never came back. We can chase the Devil off as well. Prayer, worship and the name of Jesus are all powerful weapons against the enemy. If we make the our place of habitation uncomfortable for him, he stops coming around.